2018-2019 tax season is in full force since January 29th, 2019. Are you ready to learn how to file your 2018 US taxes for expats? We will cover an array of important deadlines, forms and schedules. We will also share with you penalty-free ways to file late taxes if you haven’t been compliant. One of the most important updates of 2019, which gives hopes for Americans abroad, is a new bill in Congress. Congressman Holding from North Carolina introduced “The Tax Fairness for Americans Abroad Act. It might end the 114-year-old US citizenship-based taxation. Have you got any questions? Download our free e-book for Americans abroad. 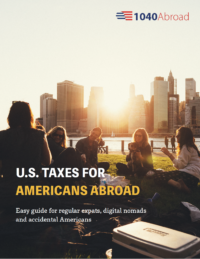 US taxes on foreign income: who should file a US expat tax return? While many Americans abroad wonder if they have to pay US taxes on foreign income, the real question is about filing tax return itself. Many of US citizens living overseas do not owe any taxes to the IRS. However, it doesn’t mean they don’t have to report their income on Form 1040. Majority of US expats confuse the filing threshold with Foreign Earned Income Exclusion. The latter one doesn’t determine your filing liabilities. It is there to exclude all or part of your foreign-source wages and self-employment income from U.S. federal income tax. Yet you need to file a federal tax return and form 2555 to use Foreign Earned Income Exclusion. There are a few things to remember about US tax filing obligations. First of all, determine if you are a U.S. person for tax purposes, as you do not necessarily need to have a US passport to possibly have US tax filing obligations. You may even need to file even if you don’t earn any money yet you are married to someone who has income. Yes, we know that US taxes can be quite complicated! Tax Tip 1: Even though we have already mentioned FEIE above, don’t rush to select Foreign Earned Income Exclusion on your US expat tax return. In many cases, choosing Foreign Tax Credit is more beneficial. Tax professionals prefer the latter for a number of reasons. Basically, you will need to file US expat tax return for 2018 tax year if you earn above filing threshold mentioned in a table above. While we are only a month away from April 15th deadline, don’t panic because all U.S. citizens abroad receive an automatic deadline extension to June 15th. But keep in mind, that if you owe any taxes to IRS, you will need to file and pay your taxes by April 15th deadline. Yes, it applies to everyone, regardless of your residence. What if I am a US citizen abroad and I never filed a tax return? If you happen to be in this situation, don’t panic. A lot of American overseas are in the same boat as you. They all fear hefty penalties thus hesitate to get caught up on delinquent returns. If you are a US citizen abroad and you never filed a tax return, then we recommend you to take a look at the IRS amnesty program. Tax Tip 2: All the returns must have a valid Taxpayer Identification Number (TIN). The proper TIN for U.S. citizens, residents abroad and some other individuals will be a valid Social Security Number (SSN). We recommend filing US taxes for expats before IRS finds you. We have been using the IRS tax amnesty program for our late filers, given they qualified to participate in it, and none of our clients has ever had to pay any penalties or fines. It’s the easiest way to catch up with your U.S. tax obligations: you will need to file the last 3 years of federal tax returns and 6 years of FBARs. A straight-forward process which will give you peace of mind. Tax Tip 3: We encourage you to seek professional tax advice before proceeding with Streamlined Procedures. We offer free consultation calls as well as email support. Tax Tip 4: It’s better to file and pay the tax due before the IRS finds you. If the IRS has initiated a civil examination of a taxpayer’s returns for any taxable year, regardless of whether the examination relates to undisclosed foreign financial assets, the taxpayer will not be eligible to use the Streamlined Procedures. If you think what FBAR reporting is, read further. Any U.S. citizen, U.S. resident, Greencard holder and other US persons for tax purposes have to declare any financial accounts outside the US. If you have an aggregate value of at least 10,000 USD at any time during the year, then you need to file FBAR. This year’s FBAR deadline is April 15, 2019. However, there is an automatic extension to October 15th, 2019. In case if you decide not to file FBAR even though you knew you had to do that, your wilful failure to file will cost you 50% of the account balance at the time of the violation or 100,000 USD civic penalties. As well as there are other penalties for not filing FinCEN Form 114 on time. Those can reach up to 10,000 USD per violation. There is also a FATCA – Foreign Account Tax Compliance Act. It’s an informational report, which is a part of Form 8938. The requirements for FATCA are different from FBAR. US person has to file it if they are filing single and have 200,00 USD at the end of the year, or 300,000 USD at any point during the year. Married Filing jointly has another threshold for Form 8938 – 400,000 USD at the end of the year, or 600,000 USD at any point during the year. There are hefty penalties for failing to file this form. Now let’s talk about tax deductions, credits and exclusions for US expats. While many Americans living abroad prefer Foreign Earned Income Exclusion, we highly recommend seeking professional advice on using Foreign Tax Credit. To use FEIE you will need to pass either Physical Presence Test or establish Bona Fide Residency for a full calendar year in a foreign country. FTC will offset or reduce your US tax obligations on income tax you paid to another country. Foreign Housing Exclusion will help you to exclude costs of rent and utilities on top of the first 100,000 USD. Note that each city has a different limit. What about “The Tax Fairness for Americans Abroad Act”? Congressman Holding introduced this tax bill. It raises a question of transitioning from the current citizenship-based taxation system to residence-based taxation. Basically, it will be separating foreign-source and US-source income and exclude the former one from US taxation. A US citizen will need to be a qualified resident abroad. With Trump’s tax reform, there were quite big changes for Americans abroad. Especially those who have foreign corporations. So the new tax bill eliminated all personal and dependent exemptions. However, the standard deduction has doubled. The standard deduction is a cut of income that is not applied to tax. You can use it to decrease a tax bill instead of itemising deductions. So if you happen to have a lot of expenses that are tax-deductible, like giving money to charity, you will benefit from itemising deductions. Tax reform largely impacted Americans abroad who have US sourced income. So if it’s not your case, then you can stay calm. But if you have controlled the foreign corporation, then you might be hit by GILTI and Transition tax. We offer free consultations and we would love to help you with your US tax situation! While U.S. taxes for expats are complicated and can cause anxiety, don’t worry. At 1040 Abroad we are committed to making your life easier by taking care of your US taxes. Contact us if you want our help and receive a free 20-phone consultation. I am a US citizen with a SSN but have been living in the UK under a Tier 2 working Visa for nearly 5 years. I do not earn money from US or collect income from there. What do I need to do about filing and making sure I’m on top with the IRS?